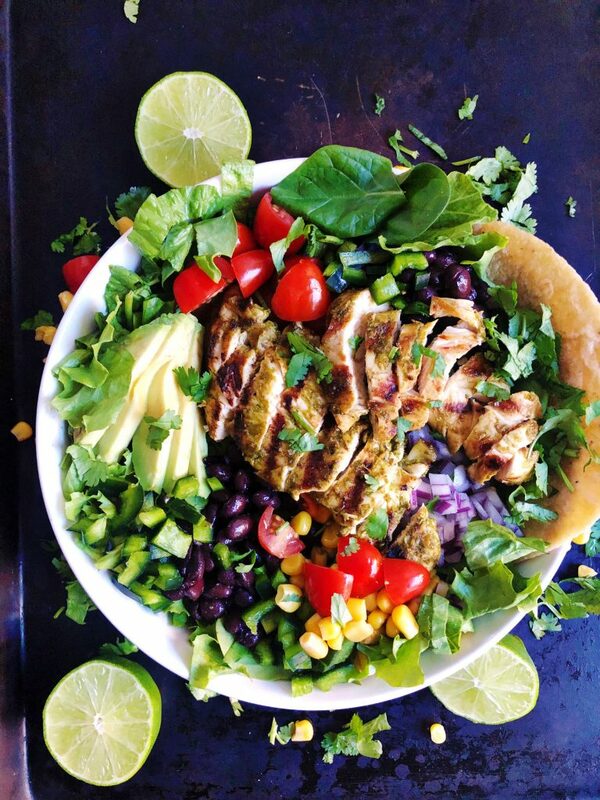 Next up is this Cilantro Lime Mexican Chicken Salad – the marinade for this Cilantro Lime Chicken is insane. It’s tons of fresh ingredients and spices all blended up then slathered on the chicken to marinate. Then you grill the chicken. Then, you assemble the salad with another delicious creamy and sweet cilantro lime dressing. All the fresh ingredients are like a flavor explosion. 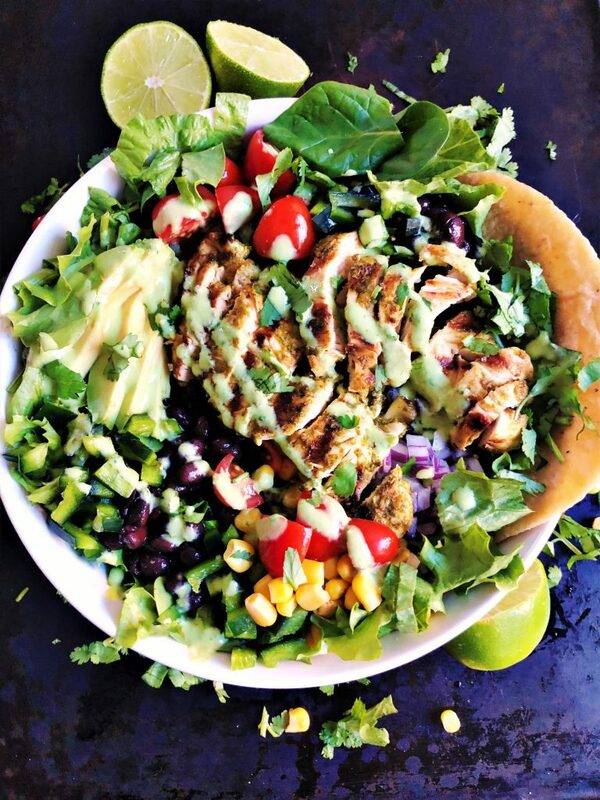 You have got to try this Cilantro Lime Mexican Chicken Salad. Place chicken breasts in a large ziploc bag. Add remaining marinade ingredients into a food processor or blender and puree until smooth. Pour marinade over chicken breasts and marinate in fridge for at least to hours, up to 24 hours. When ready to cook, heat grill or a griddle to medium high heat. Let heat for at least 5 minutes to warm up. Once hot, remove chicken from ziploc bag with tongs and gently place onto grill. Cook for 5-7 minutes per side, until done, depending on thickness of chicken. Once cooked, remove from heat and set on a cutting board to rest for 5 minutes before cutting. Once rested, cut chicken into slices and top on salad. Prep the dressing ahead of time so you can chill it. You can make it an hour or two before eating, or make it the day before and chill. Pulse all ingredients in a food processor or blender until well combined. Pour into an airtight container or squeeze bottle with a lid and chill until ready to serve the salad. Before cooking the chicken I like to chop all the salad ingredients up and set them in bowls. Then I can focus on grilling the chicken and as soon as its done assemble the salad. Layer in the salad ingredients starting with the lettuce, spinach, and tortilla on the bottom Then add the remaining ingredients. This is a great way to use up extra Mexican toppings after a taco night. Drizzle with tons of the Creamy Sweet Cilantro Lime Dressing just before serving. Toss salad, top with a squeeze of fresh lime juice, and enjoy! 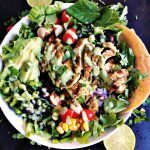 This Cilantro Lime Mexican Chicken Salad is a great salad to make the night after having tacos – use up all those extra toppings on your salad. Or do we like we do and make the salads for the adults, and use the ingredients deconstructed to make tacos or burritos for the kids. The Creamy Sweet Cilantro Lime Dressing is my favorite part of this salad. It takes a bit of prep work but you’ll love it. 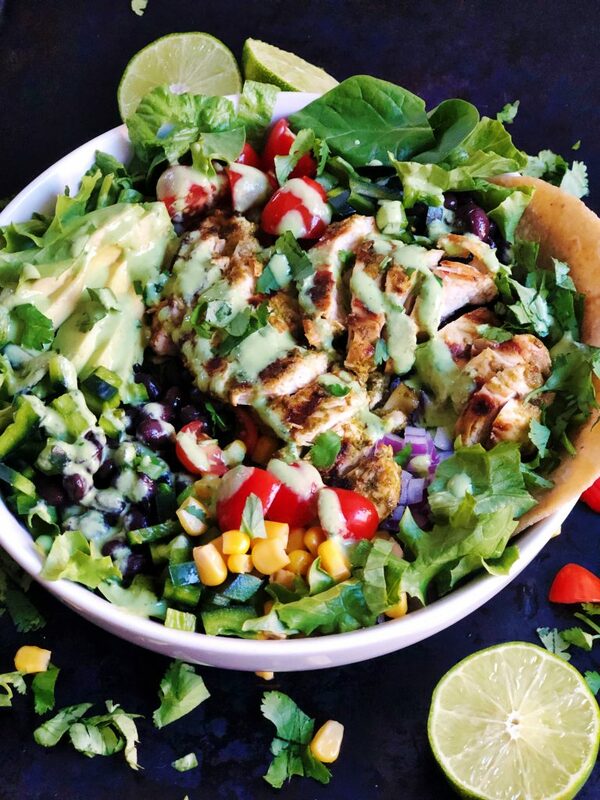 Please tell me if you try this Cilantro Lime Mexican Chicken Salad! And check out my other salads here. Tag me @plumstreetcollective on Instagram. Thanks for reading!